UV Radical Ray Rampage, an action platform video game about tanning zombies developed in collaboration with UC Davis that allows participants to learn about skin cancer risk factors and how to reduce risk using an immersive arcade-like experience. This game won silver medal at the 2012 International Serious Play Awards. 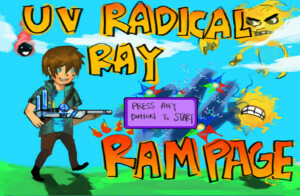 UV Radical Ray Rampage takes 10-15 minutes to play. To get started, select below! Use the “space bar” for “enter”. For more information and resources about skin cancer and sun safety, check out our research page. This project was funded by a Science Education Partnership Award with supplemental funding provided by the Walsh Family Foundation. Game programming by Matt Steinwachs and Marco Molinaro (UC-Davis).